Drawing on the recent discussion about the role information intermediaries (infomediaries) play in affecting corporate responsibility (CR) adoption, we analyze the representation of CR issues in a business infomediary distributed by a leading business organization. The explicit task of the business infomediary is to promote a competitive national business environment. 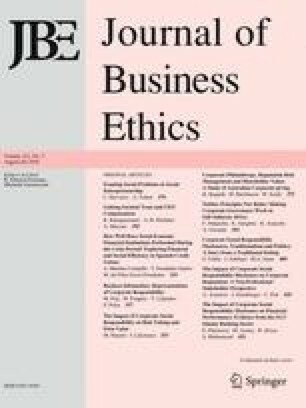 This paper contributes to (1) research on CR, by providing new knowledge on the current CR discourse within the business community, and (2) research on infomediaries, by introducing a distinction between watchdog-oriented and business-oriented infomediaries. The findings show that the business infomediary promotes green practices and constructs a national business identity in terms of environmental business when responsible practices are voluntary. We argue that as business-oriented infomediaries shape the meaning of CR according to their own interests, signifiers that refer to the positive contributions of business become preferred in the articles. Confederation of Finnish industries. (2014). Confederation of Finnish Industries. Accessed June 2, 2015, from http://www.ek.fi/ek/en/index.php. European Commission. (2011). A renewed EU strategy 2011–2014 for corporate social responsibility. Accessed October 22, 2014, from http://eur-lex.europa.eu/LexUriServ/LexUriServ.do?uri=COM:2011:0681:FIN:EN:PDF. Finnwatch. (2011). Risuja ja ruusuja komission tuoreelle yritysvastuulinjaukselle [Bouquets and brickbats for the European Commission’s new CSR definition]. Accessed July 21, 2015, from http://www.finnwatch.org/fi/uutiset/30-risuja-ja-ruusuja-komission-tuoreelle-yritysvastuulinjaukselle. Kepa. (2014). Temaattiset suositukset. Yritysvastuu [Thematic guidelines. CSR]. Accessed July 21, 2015, from http://www.maailmantaloudentekijat.fi/tiedostot/temaattinen-suositus-yritysvastuu-2014.pdf. Ministry of Employment and the Economy. (2014). Corporate Social Responsibility (CSR). Accessed December 2, 2014, from http://www.tem.fi/en/enterprises/corporate_social_responsibility_(csr). Natural Resources Institute Finland. (2015). Natural Resources Institute Finland. Accessed April 19, 2015, from http://www.luke.fi/en/. Nordiska ministerrådet. (2014). Strategi för internationell profilering och positionering av Norden 2015–2018. Accessed July 21, 2015, from http://www.norden.org/is/norraena-radherranefndin/skrifstofa-norraenu-radherranefndarinnar/upplysingasvid-komm/verkefni/strategi-foer-internationell-profilering-och-positionering-av-norden-201520132018. Pippuri, M. (2012). Asiantuntija: Talvivaara on 2000-luvun vakavin ympäristöonnettomuus [Expert: Talvivaara is the most severe environmental accident of the decade]. Accessed January 7, 2015, from: http://www.hs.fi/kotimaa/a1305614058708. Sanoma Magazines. (2013). Elinkeinoelämän Keskusliitto. Accessed May 24, 2013, from http://www.sanomamagazines.fi/yritysjulkaisut/asiakkaamme/ek/. The Finnish Associaton for Nature Conservation. (2013). Talvivaaran kaivos suljettava [Talvivaara mine must be closed down]. Accessed January 7, 2015, from http://www.sll.fi/ajankohtaista/tiedotteet/2013/talvivaaran-kaivos-suljettava. UPM. (2015). About UPM. Accessed June 2, 2015, from http://www.upm.com/EN/ABOUT-UPM/Pages/default.aspx. World Economic Forum. (2014). Global competitiveness. Accessed October 22, 2014, from http://reports.weforum.org/global-competitiveness-report-2014-2015/economies/#economy=FIN.